It is the time of year that thoughts turn to summer breakaways. In the first of a weekly series, CHRISTINA DIMITROVA and VELINA NACHEVA highlight some of the attractions of Bulgaria's north and south coasts this summer of 2004. As summer approaches, people begin to consider holiday plans and start wondering which direction would suit them best this year. The peace and quiet of the North Coast of Bulgaria is a choice that many make based on its luxurious holiday packages, tour operators and foreign guests. The North coast extends up from Kavarna, Albena, Balchik, Varna, Golden Sands and Sinemoretz and is among top ten best destinations for the end of June, mid July and for August holidays on the beach. Escaping to an immeasurable number of newly built hotels, camping grounds and summer cottages, the Black Sea Coast attracts large families, children of all ages, teenagers and also retired people. They may all seek different things there, such as the calmness of its nature, the combination of sun but mild weather, cultural sites, or less rainy days and bearable heat. The closeness to Varna, sea capital of Bulgaria, is an advantage for all the resorts nearby that welcome holiday makers seeking their own holiday lifestyle. Varna has a lot to offer for working people and vacationers. It offers a varied mixture of museums, medieval locations, mineral springs and monuments. It also has a network of lively pubs, dance clubs and by-the-beach cafes, as well as recreational pastimes. Varna hosts probably the greatest collection of museums and artifacts on display, after Sofia. Bulgaria's only Aquarium with a unique facade covered in ivy also attracts many visitors. The Terrarium has one of the most diverse collections in Bulgaria, with more than 40 different kinds of exotic animals from all over the world and many interesting and rare Bulgarian species. The Museum of Varna gathers treasures from all periods in the city's history, and is suitable for both recreational tourism and cultural trips. The Ethnographic Museum has exhibited objects showing traditional means of livelihood and costumes with varying demographic features. A rare museum that cannot be found in many places, let alone in Sofia, is the Naval Museum located in the Marine Gardens of Varna. The Dolphinarium, located in the heart of Varna, features a unique programme in which dolphins perform acrobatics, dance to music and balance different objects, as part of the "tursiops" show. Music Weeks in Varna will last until October, where artists who work in the field of music, the theatre and dance will turn the center of the sea capital into a stage. The May Choral Competition, held at the end of May, is highly regarded. Actors and theatre lovers come to Varna from all over the world for the Theatre Festival in the beginning of June. The two months of June and July are largely dedicated to classical music, whereas the Jazz Fest and the International Folklore Festival will be held in August. Two autumn festivals, Love is Folly, and the Bulgarian Film festival, The Golden Rose, will attract numerous fans of the art of filmmaking as they do every year. The Golden Sands resort is 17 km away from Varna, featuring a magnificent environment with richly forested hills and white golden beaches, surrounded by many famous and ancient mineral water springs. The resort is situated in an area considered to be a Bulgarian National park. The water temperature in the resort rises to between 25 to 28 degrees and keeps this level throughout July, August and the beginning of September. Hotel Imperial Golden Sands is suitable for recreation with less access to the natural beach. The covered spa-water swimming pool, solarium, four bowling alleys, table tennis and billiards facilities are complemented by the great diversity of water sports. These include water skiing, banana riding, yachting, surfing, fishing as well as volleyball courts on beach, and tennis courts. Such opportunities add up to a more sporting program for seaside summer holidaymakers. The place also has the attraction of its therapeutic natural spas. If you haven't made up your mind on what is the best and most suitable destination for recreational tourism this summer, another venue is St Constantine and Elena resort. Since its establishment in 1948, it has the character of a smaller and friendlier holiday center, and is the longest established resort. It’s only eight km north of Varna and offers more possibilities for a restful holiday. The hit of the season, like last summer, will be the better developed balneo-therapy locations, offering mud bath cures for disturbances of the locomotors systems, disorders of peripheral nervous system, gynecological diseases, and metabolic problems and anti stress therapies. Those with more money to spare can visit the Grand Casino Varna, one of the biggest casinos by the black sea coast. It features American roulette, black jack, stud poker, punto banco, as well as various programs and shows. For family holidaymakers, Golden Sands resort organizes many sports competitions, games and other pleasant past-times, like children's characters from puppet shows. Pony-rides, archery, slalom slides, mini golf, computer and electronic games, children's railways, inflatable castles, water toboggans are also available for all. The adults can also enjoy the nightlife in discos. Entertainment this summer will be enriched with the International Varna Summer Festival of opera, ballet, theatre, jazz and folk music. Tickets will be available at the outdoor booths in the resorts as well as at the bigger hotels. Albena Resort is one of the few resorts on the Black Sea Coast catering to the holiday maker geared towards ecology and natural therapies. Its fresh air, crystal clear sea, mineral water spas, remedial herbs, various natural products and its entertaining range of summer events, promise a happy and beneficial stay. On June 10, a football tournament for children starts at the Albena resort followed by beach volleyball. In Luciano they will hold a similar tournament from June 13-16. The two-day international Bridge Festival starts on June 25 and will be followed by a weeklong sports tournament starting on July 3. XVII AGBU World Games are also hosted in Albena from July 9 to July 13. Table tennis starts on July 29 and will continue until August 1. Towards the end of the season there will be a wrestling championship in Albena in the beginning of September. 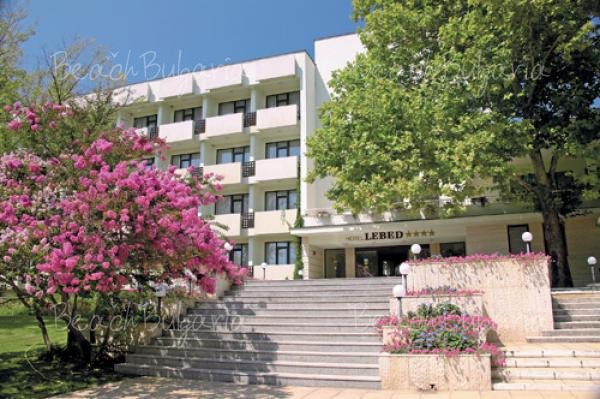 During the Golden Albena Festival, the Albena resort of becomes pivotal to the television and advertising industry of Bulgaria. Foreign holidaymakers at the resort are fascinated by the international folklore festival Dobrudja Sings and Dances. This year, just as last year, a traditional Bulgarian wedding will be held in the village of Chukurovo, close to Varna, and is certain to be a tourist draw card. Tourists can take part in the traditional ritual of a "Bulgarian wedding", learning the dances that accompany it. A photo Safari, an archaeological itinerary and a visit to Cape Kaliakra are only a few of the various popular excursions. Boriana Yacht Club, open from 8am to 6pm, offers windsurfing lessons, boat rides, water parachuting and jet skiing. As you drive south from Nessebar along the coast, you come across the village of Ravda, once known for its large youth complex, consisting of bungalows. It is still preferred by youth and budget travelers. The main bonus of Ravda is that it is quiet and peaceful and at the same time is only three km away from Nessebar and four km away from the big resort Sunny Beach. The village itself has two guarded beaches, many small family hotels, clubs, bars, restaurants and discotheques, currency change bureaus and regular public bus transport and taxis. Recently, the Oasis complex opened in Ravda offering two hotels, separate small houses, swimming pool and a guarded parking lot. Both the hotel suites and the houses can be rented for the entire summer or for several days only. POMORIE Further down south is the town of Pomorie. In Bulgaria it is famous for its rakia and wine and for the curative properties of its mud baths. The ancient Greeks and Romans first discovered the curative properties of the mud and lye. Modern balneology started in the beginning of the 20th century after a thorough study of mud and lye properties. The curative substances are known to have effect on the locomotors system, kidneys, uric tract and the reproductive organs. Soon the town will also become famous for its Golf & Beach Resort, which is still under construction by the Dutch investor N.V. Capital Ground & Building Investment. It will have hotel apartments, a swimming pool complex, several restaurants, and a marina with fixed moorings, shops, tennis courts, golf courses, a casino and a promenade. BOURGAS The city of Bourgas is the second largest city on the coast after Varna in the north. It is considered the gateway to the south part of the Black Sea coast. It was established in Roman times but emerged in the late 19-th century as an industrial and trade center, and valuable seaport. The international airport is in the Sarafovo neighborhood of Bourgas and bustles with chartered flights and tourists in summer. The Museum of Nature and Science is another place of interest to visitors of the city. It contains more than 1200 exhibits of insects and reptiles and more than 140 species of fish, plants growing in the district of Strandzha, and other protected and endemic species. The city also has an opera house, a philharmonic hall, several galleries, the Dramatic Theatre, a puppet theatre and cinemas. Bourgas is also known as the "city of festivals" because in the summer and early autumn it hosts a number of festivals, such as the International Folklore Festival in August in the open-air summer theatre, the pop music festival "Bourgas and the Sea" held in the Sea Garden, the rock music festival Rock Explosion, a blues festival, a theatre festival and an Autumn Literary Celebrations. For nature lovers, around Bourgas there are three lakes, Atanassovo Lake, Bourgas Lake and Mandensko Lake. The Atanassovo Lake is to the north, between the airport and the city. It is 10 km long and was once a nestling site of many marsh and sea birds migrating from Gibraltar and the Bosphorus. Part of the lake is a natural reserve. There are sites for fishing, swimming and recreation. The Bourgas Lake is a nestling site of pelicans, ibis, and herons. It offers many recreational opportunities as well. Mandrensko Lake is 10 km south of the city and is also an important ornithological reserve with a large bird population in the summer. It is also appropriate for rowing tours and recreation. SOZOPOL Around 30 km south of Bourgas is the ancient town of Sozopol. It was established by ancient Greek colonists and named Apollonia. It has been a flourishing trade and fishing center for centuries. 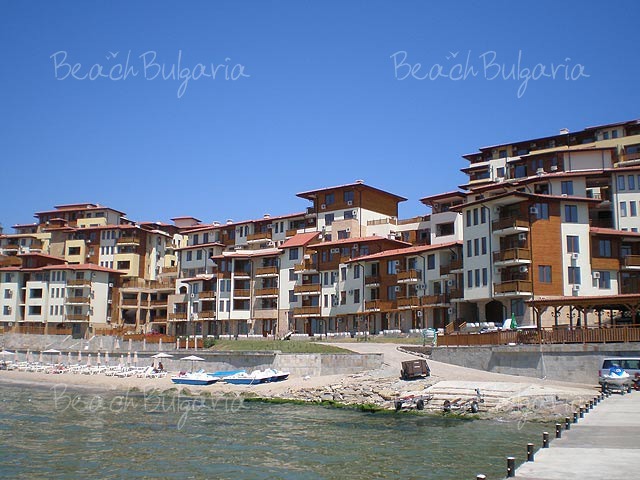 In its more recent times, Sozopol has been the favorite summer resort for bohemians and young people and quite often in the summer months, young people would meet a crowd of friends from Sofia in the square in front of the post office. The town is provisionally divided by the central beach into the New Town and the Old Town. The Old Town, with its typical old houses, with walls covered with boards against the salty air and the wind, yards overshadowed by old vines and fig trees and narrow cobble-stoned streets, is a rather romantic place and the main tourist attraction. The New Town has more conventional modern houses and a number of new luxurious hotels overlooking the central beach. Sozopol is well known for its autumn art festival, Apollonia, which gathers musicians, actors, artists, poets and writers in a two-week celebration of art in all its forms. This year it will mark its 20-th anniversary and will take place between September 1and 10. DYUNI Several kilometers further south is the Dyuni Resort. 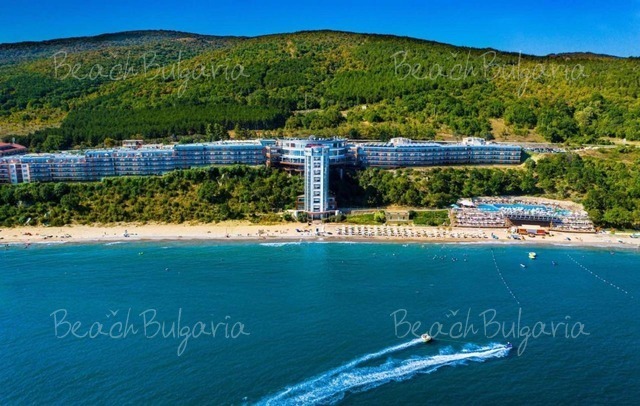 Built in the late 1980's as a joint project between Bulgaria and Austrian investors, the resort mainly targets and caters for foreign tourists. It is situated in a small bay just north of the Arkutino beach known for its wild beauty and rough sea. The resort offers suites in snow-white villas of beautiful architectural design. These are divided in three zones - Zelenika, Marina and Pelikan, and are surrounded by plenty of cultivated green areas. The holiday city features developed infrastructure, with various sports facilities (including such for water sports), bars, discos, restaurants, etc. ROPOTAMO RIVER Just south of Arktuino beach is the Ropotamo River nature park and game reserve. The river, though only 50 km long, is extremely beautiful and is the home to many rare wild birds such as pelicans and herons and white rock eagles who live on the rocks hanging over the river. The river's most popular attraction are the organized boat trips in its lower section, where visitors can observe the river's inhabitants in their natural habitat and the beautiful nature reserve. The starting point of the boat trip is only a few minutes' walk from the main road. Boats leave every half an hour or one hour in less busy periods and tickets are inexpensive. In the shallow marshes near the river grows a unique type of yellow water lily. The Ropotamo Game Reserve is known for its fallow deer, wild boar, roe deer, wolf, fox and jackal, which are the main game species. The migratory birds' route of 'Via Pontica' also passes over the territory of Ropotamo, which is connected to the variety of wild duck, geese and particularly woodcock, which can be hunted in the autumn and winter. Further down south there are numerous small resort towns such as Primorsko, Kiten, Lozenets, Tsarevo, Varvara, Ahtopol and Sinemorets. They are popular with good accommodation is reasonably priced.